Stoneleigh Cricket Club was founded in 1839 – at Stoneleigh Abbey by Lord Chandos Leigh and is one of the oldest and most famous cricket clubs in Warwickshire. 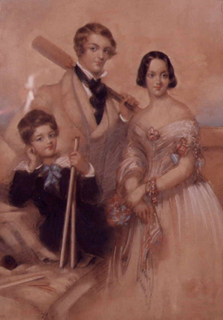 His eldest son William Henry Leigh (pictured to the left holding the bat in a painting dated 1842) was attending Harrow School and convinced his father to have a cricket ground laid out in front of Stoneleigh Abbey’s West Wing so that he could play cricket on his return back from Harrow School in the summer months. Lord Leigh was receptive to the idea having played cricket at Harrow School with Lord Bryon, who famously played in the first Harrow v Eton match in 1805! left holding the stumps! ) was to become Stoneleigh Cricket Club’s most famous player. 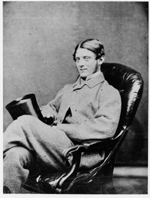 Edward played for Stoneleigh Cricket Club (1839-51), Harrow School (1848-51), Oxford University (1852-54), Gentleman of Warwickshire, Gentleman of MCC and I Zingari (1853-72). Edward was one of the major figures in the future development, administration and success of cricket. He was secretary of the infamous I Zingari cricket club and an influential MCC committee member. He was honoured as President of the MCC in 1887 – the MCC’s 100th Anniversary and Queen Victoria’s Golden Jubilee year. Stoneleigh Cricket Club’s first recorded match of significance was against Rugby School in 1849. The match report was published in the Leamington Courier. Stoneleigh Cricket Club was captained by Edward Chandos Leigh and most of the players had played a few days earlier for the Gentleman of Warwickshire v I Zingari at the Wisden & Parr ground in Leamington. It might be argued that Stoneleigh Cricket Club was represented by some of the best players playing in Warwickshire at this time.The Stoneleigh Cricket Club v Rugby School match is still played today. 1849 was the start of a world-famous, and on-going tradition! In 1850 William Henry Leigh succeeded his father to become Lord Leigh. He was to support Stoneleigh Cricket Club for the next 55 years and encouraged his sons to play for the Club. This is beautifully depicted in Stoneleigh Cricket Clubs Fixture Cards dated 1868. The fixture cards record matches played in 1868 against local clubs and schools, including Stratford CC, Coventry and North Warwickshire and Warwick Borough School. In 1872 Stoneleigh Cricket Club hosted an official recognised Warwickshire match which was played between The Gentleman of Warwickshire v I Zingari to celebrate William Henry Leigh’s eldest son – Gilbert Henry Leigh – 21st birthday. Stoneleigh Cricket Club’s early history between 1839 – 1872 mirrored the increasing popularity of cricket, known as the ‘golden era’ of cricket. During this period Stoneleigh was part of a local mid-Warwickshire cricketing revolution centred around the famous Wisden & Parr Royal Leamington Spa ground. Our own cricketing son Edward Chandos Leigh was influenced by this local cricketing phenomenon and was to make a major contribution to the administration of cricket at the MCC and beyond. In 2004 Stoneleigh Cricket Club celebrates its 165 year and was recognised by Wisden Cricketer as the ‘loveliest ground’ in Britain. We hope you enjoy our research into our early history.